A pledge is a type of gift in Causeview, where a constituent promises to give a certain amount of money in installments over time. A payment toward the total pledge amount may be made at the time that the pledge is saved in Causeview, and a schedule for future payments is automatically generated by the application. Over time the pledge must be managed in order to edit the schedule or submit completed payments. In some cases a constituent will commit to a pledge of a certain amount and will not complete payment of the pledge. This can occur for many reasons, but it is important for your records that the payment does not remain as “Pending” or “Committed” in your system if the pledge is no longer open. It is not good practice to delete pledge payments, and they should be retained as records of constituent commitments. When you know that an expected pledge payment will not be paid you can mark it as “Written Off” in Causeview. If a partial payment is made, it is best practice to write off the original payment and create a new payment with the adjusted payment amount. In order to edit or manage a pledge, you must first locate and view an open pledge transaction. In order to write off an expected pledge payment you must begin from the payments related list on the pledge transaction. Find the payment that will not be made, and click to “Edit” it. This will open the payment edit screen. 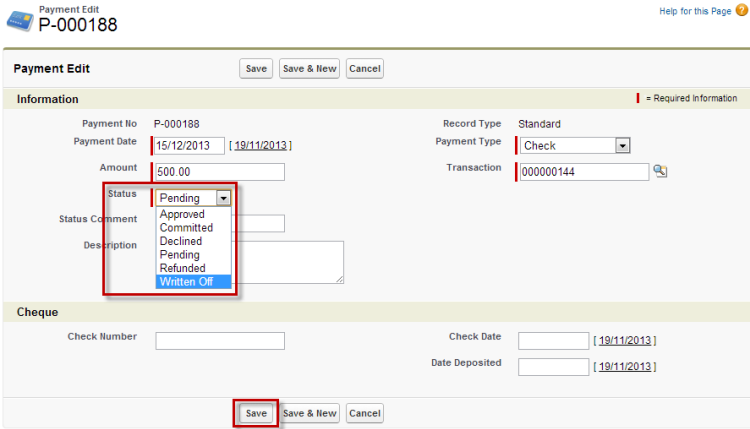 In order to write off the payment in the system, simply change the status of the payment to “Written Off” using the drop-down list and then save the payment. On the transaction detail page, locate the payment in the payment related list and confirm that the status is set to “Written Off”.